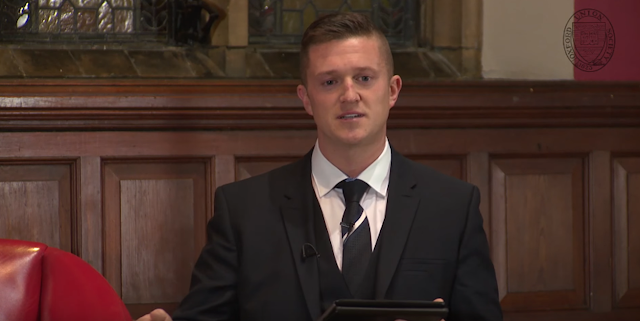 Tommy Robinson, real name Stephen Yaxley-Lennon, is a prominent member of the British "far-right". He co-founded the notorious English Defence League (EDL), was previously a member of the BNP and is currently a part of the German-originating Pegida group, which stands for ‘Patriotic Europeans Against the Islamisation of the West’. In 2014, Tommy spoke at the Oxford Union (watch it here) and now there are plans in place for him to give a speech and participate in a Q&A at the University of York. I spoke to him about speaking at universities and free speech in the UK. I asked him why he thought universities invite him to speak, and why it is that he has taken up the offers. TR “When I walked into Oxford University, I doubt very much many people come from the background I’ve come from or lived in the areas I have. So when they go into their life and into their careers, they need some sort of understanding of why people feel are feeling like this.” And he says he thinks he achieved this in Oxford. He says “I talk on behalf of a lot of people, who are scared to raise these issues”. Of course he’s fully aware of the opposition that he faces on university campuses, and recognises that even getting his views across is more than an uphill struggle. “I know I’m going into these universities where most of these students don’t like me… there’s no benefit to me”. I was going to bring his views on ‘no-platforming’ up, but he did it for me. Inevitably he was critical. So should anyone ever be banned from talking at universities? TR: “The numbers speak for themselves. If you look at ISIS recruits from Germany, 60% of them are university graduates… I think it’s a huge problem embedded in the British education system”. “When you live away from home for the first time, you’re vulnerable. That’s when they’re preying on people. That’s wrong. That’s what’s happening. I think that kids going to university should be protected. Protected from the ideology of [radical Islam]. TR: “Most Muslims don’t oppose me coming. This is what I’ve said to everyone: if anyone wants to talk to me, whether it be the Muslim association, whether it be Muslim groups at universities, I’m happy to, after my talk, talk to them and discuss and debate. If people want to protest me, I’m happy afterwards to come out and talk to the protesters. I’m happy to sit down and discuss my ideas with them. I’m happy to debate any of them. TR: “The country I thought I lived in is a very different country to the one I accept I live, when it comes to freedom and democracy. Whether you disagree with me, despise me, hate me or you love me, I have a right, in this country, to talk”. This interview is to help get an insight into the views of Tommy Robinson on free speech in the UK and his experiences speaking at Universities. I want it to contribute to a wider debate around free speech and who should be invited to speak on campuses. The interview was not about Tommy’s views on Islam or his past political activates. Tommy Robinson is due to speak at the University of York on 19th January 2017. Of course he has a right to speak. Whether you agree or disagree with him, or anyone, discourse is the only alternative to violence, there is no third option. We either work our differences out, or we battle for supremacy. He is right what he says about Trump and Brexit too. I have been socially liberal all of my life, but such totalitarian behavior is bording on Marxism, not merely left-leaning politics. Seeing the likes of Anjem Choudary and Asghar Bukhari say genuinely disgusting and hateful things n Sky Tv proves this. The latters speech about Charlie Hebdo was one of the most vile things I have ever seen, and it was put on the air for all to see. Beat Tommy Robinson in a debate, but he absolutely must be allowed to speak, silencing controversial people is the first step on the road to fascism. The right to free speech does not exist to protect popular opinion, for no one desires to censor that with which they already agree. The Left's tactics of silencing opposition speech are the hallmark of totalitarianism and must be opposed at every turn.